Last Thursday, Nov. 8, men’s basketball competed in what turned out to be an instant classic against the panthers of Greenville University. 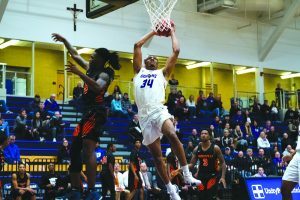 There was virtually no defense played in this one, as the Duhawks rolled to a convincing 147-129 win. Each team also managed to break the 60-point mark at halftime. Loras seemed to struggle early, missing shots and giving Greenville quite a few chances on the offensive end. 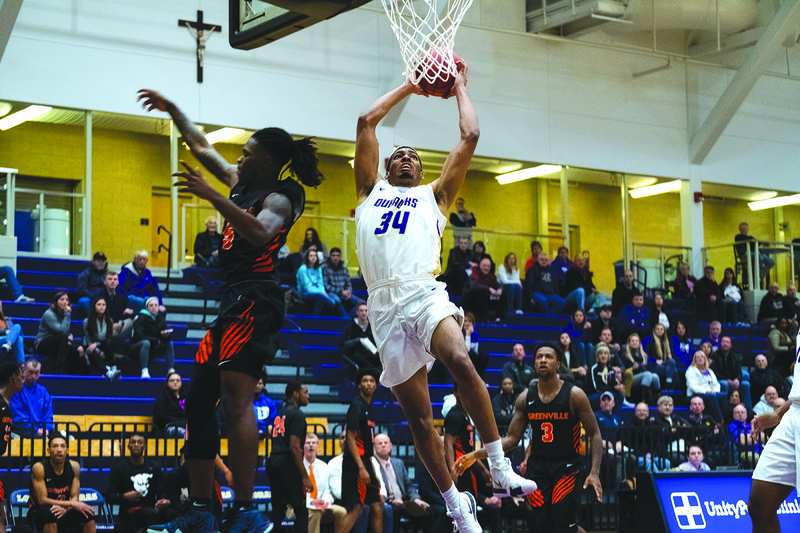 One first half highlight for the Duhawks was that of first-year Jordan Boyd, who had a monster posterization of Greenville’s Eric Williams. Facing their largest deficit of 11 points, Loras was able to finish the first half strong and cut the lead to four at the break. The second half belonged to the purple and gold. The Duhawks outscored the Panthers 83-61, and ran away with the game, winning by 18 points. With the Duhawks putting up 147 points, you know that everyone was getting buckets. Senior Josh Ruggles led the way in the scoring category, shooting 9 of 17 from the field, including 17 points from the line, and finishing with 39 points. Senior Ryan Dicanio poured in 29 points and shot 75% from the field. Sophomore Rowan McGowen and Senior Jake “Tito” Toman both recorded double-doubles, and first-year Jordan Boyd’s collegiate debut saw him put up 18 points in 16 minutes. The main takeaway from this game was how composed the Duhawks stayed after struggling in the first half. Greenville had the strategy to press from the opening tip, and force lots of turnovers in the backcourt. After opening the game with sloppy play, Loras was able to manage the pressure and push the ball up court for easy transition points. It was obvious that by the second half, the Panthers were exhausted, impacting their ability to get back on defense and convert shots on the offensive end. Loras used this to their advantage and surged to 83 second half points to claim the victory. The Duhawks next tip-off tomorrow, Nov. 16th at home against St. Scholastica at 8 p.m. This is the first game of the season for St. Scholastica, who finished 17-9 overall last season in the Upper Midwest Athletic Conference (UMAC). It is a quick turnaround after that, with Loras playing Saturday Nov. 17 at 6 p.m. against Michigan Intercollegiate Athletic Association (MIAA) foe Olivet College.